North Carolina continues to rank high among the best states in the nation for business climate and corporate tax rates. The state is also recognized as one of the most competitive for new business. Here in Currituck County, that momentum continues with several key projects in development that will help secure our region’s future success. A new, $1 billion interstate highway will connect Norfolk and Raleigh and open a high-speed, unobstructed route between the Port of Virginia and North Carolina’s Research Triangle. The road, to be called Interstate 87, could take as long as two decades to complete. This freeway could open the distribution channels in the mid-Atlantic region like never before. I-87 will link the intellectual and healthcare industries of Raleigh (one of the Top 20 fastest growing cities in America according to Forbes - 2018) to the deepest port on the eastern seaboard, the Port of Virginia in Norfolk, and every business along the interstate stands to gain as a result. 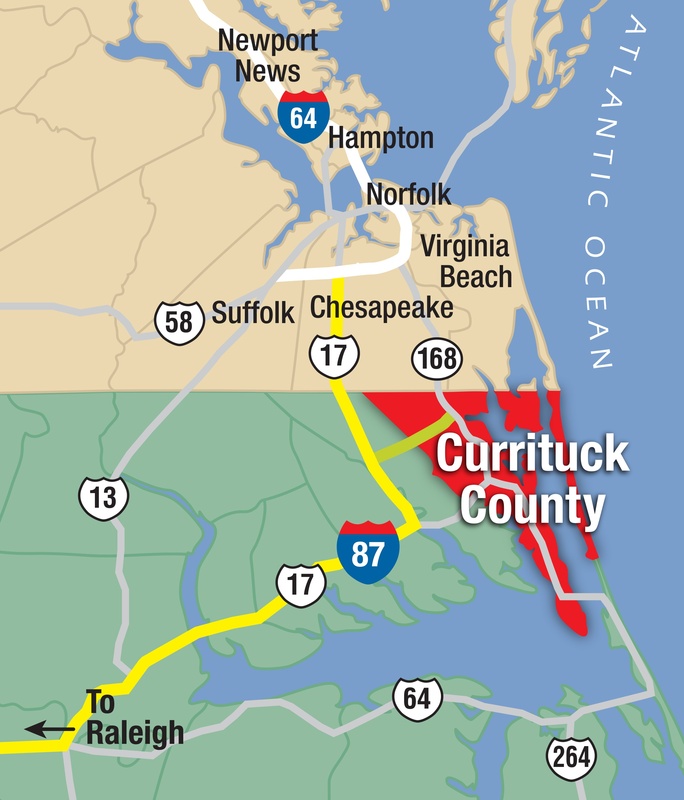 I-87 will strengthen the ability of Currituck businesses to move goods from roads to sea, and vice versa. This highway connects two key centers of commerce in the southeast, literally paving the way for high speed and high volume transport of goods from our region’s businesses to consumers all over the world. The Mid-Currituck Bridge project would create a second crossing of the sound – north of the Wright Memorial Bridge – to help alleviate congestion and improve the flow of evacuation traffic in the event of a hurricane or severe storm. The hurricane evacuation clearance times for those using U.S. 158 and N.C. 168 far exceeds the state-designated standard of 18 hours. The Mid-Currituck Bridge would also provide easier access between the Outer Banks and Virginia, as well as other communities in northeastern North Carolina. The 7-mile toll project includes a two-lane bridge that spans the Currituck Sound and connects the Currituck County mainland to the Outer Banks. It also includes a second two-lane bridge that spans Maple Swamp on the Currituck County mainland, connecting Aydlett to U.S. 158. The project has an overall estimated cost of $440 million. A portion of the funding is expected to come from bonds that will be paid back with toll revenue. The remainder of the funding is expected to come from a combination of state and federal transportation tax revenues. After taking into account funding from toll revenue, the project has an estimated cost of $173 million to NCDOT. Until the Record of Decision is announced, there is not an estimated toll rate at this time. Currituck County is continuing to invest in capital projects that will expand Currituck County Regional Airport’s (KONX) capabilities to help meet increased aviation demand – and pursue economic development, tournament sports and tourism opportunities. In 2016, the Airport completed work on a $2.3 million Southern Parallel Taxiway project, greatly enhancing the safety and operational efficiency of our visiting corporate, business and leisure aircraft. In 2017-18, Currituck Regional Airport added $3 million in new ramp improvements, tie-down spaces and for-lease hangar buildings east of Runway 23. In 2016, The U.S. Department of Commerce approved the expansion of Virginia’s Foreign Trade Zone (FTZ 20) into northeastern North Carolina, providing another means of attracting cargo to The Port of Virginia. The expansion of FTZ 20 includes the North Carolina counties of Camden, Chowan, Currituck, Gates, Hertford, Pasquotank and Perquimans; and the city of Elizabeth City.